Wait? Where Did 2013 Go? Tomorrow is New Year's Eve kids. I'll be enjoying a nice adult beverage like the one above. Mmmm. I thought I'd take a look at my New Year's resolutions for 2013 to see how I did. I'm kinda worried because I forgot for a minute what they actually were so how could I possibly work on them if I don't know what they are? 1. Healthier Meals - I workout like a champ, however I feel like it's a waste of time when I think of the choices I make sometimes when I eat. So my goal is to obtain more self control and cook more often with chicken, fish, vegetables and lean meats. 2. More playdates for Coco - Now that he's two, he's busier than ever. So I need to make a conscience effort in planning playdates and fun days with his friends and MY friends so I can get out more often, even if I am super busy. I think I did a lot better about this one, especially in the summer. He's at the point now where he love social interaction and when he's not in school, he's in my hair. I will definitely continue this one in 2014! 3. Decorating/Crafts - I moved into a house that is more than 2x the size of our last house. Therefore I need to jump on the Martha Stewart ball and start Pinteresting my way into this new house! I want to also plan some fun crafts for Coco to do because he is showing more interest in coloring and hands on activities. Oye. Let's face it. I'm just not crafty. I did add a few picture frames here and there, but being home now until April, maybe I should attempt to bring out my inner Martha Stewart? Okay who am I kidding? I can't even cut a straight line. I've come to the realization that it's really not me nagging - it's his lack of active listening. Hey hub - you need to add WORK ON MY ACTIVE LISTENING to your list this year. 2. Fast Food -- My husband is awful about this and of course I go along with it, especially when I'm exhausted and don't feel like cooking. Sometimes you can't avoid it so if we do choose fast food, I'm going to choose healthier options (if that's possible). 3. Excessive/Random Spending - I spoke briefly to this earlier today during my Target post. But I want to sit down with the budget and stick to it. Time to start saving for our Fiji trip and when we decide to welcome Baby #2! 2. Family Vacation - I want to sit down, plan a trip, pack for the trip and travel on the trip. Any suggestions? Hollaa! We went to Florida - remember? 3. Run a half marathon - Last time I signed up for the Indy Mini I got pregnant with Coco. So I'm signing up this year in hopes I actually get to run it - and not waste the $70! How did you do on your New Year's resolutions this year? Christmas came and went -- and now tomorrow is New Year's Eve. How in the world did that happen? It feels like every year we get to this point and I'm thinking HOLY MOLY it's already a new year! One of my goals for 2014 is to get my stockpile back in action. I kind of slacked during my pregnancy so I need to rebuild it back up. --Oral-B Cross Action toothbrush - $5.99 and get $2 ECB. Use $2 off (RP 11/24). Final Price: $1.99 after ECB. --Softsoap - $2.49 and get $1 ECB. Final Price: $1.49 after ECB. --Tide - $5.94. Use $2 off (Dec PG) or $3/2 (Dec PG). Final Price: $3.94 -- HOT PRICE! --Pantene - 2/$7. Use $3/2 (Dec PG). Final Price: $2 each when you buy 2. What CVS deals did you find this week? In some senses it feels like just yesterday we had a newborn in the house before bringing Lola home. I was surprised at how easily I fell back into the newborn routine with Miss Lola Girl. However, you then realize there are certain baby necessities you forgot about that really do make your life a million times easier. And being a parent of not one but two little ones, anything that makes your job just a little less stressful is what I call a baby must have. I find it's the little things that make all the difference. Lola is a pretty laid back baby. She eats, sleeps, cries and poops. Okay she smiles and coos and snuggles too but you get my point. The one thing she is really drawn to is her pacifier to help soothe her or calm her down. But I can't tell you how many times Cohen has asked for something or I've stood up to walk to the other room and that darned pacifier falls out of her mouth and goes rolling to the worst possible corner of the room. Now try holding a crying baby while bending down and searching for the pacifier that has been lost in the Pacifier Bermuda Triangle. Not cool. I kept thinking how nice it'd be if I could find something to hold on to that pacifier and get it to stay in arm's reach when it goes tumbling out of her mouth. 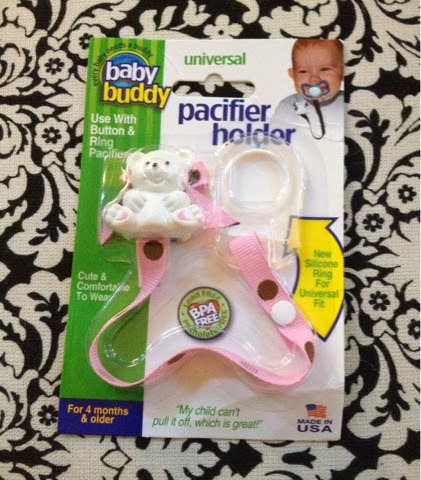 That's where Baby Buddy's Universal Pacifier Holder has come to the rescue! This thing is the bomb.com for real. The plastic ring at the end hooks on to the end of the pacifier and then I can use the precious little bear clip to snap the pacifier onto her shirt. Then when she decides to spit that sucker out, the Baby Buddy's Universal Pacifier Holder only lets the pacifier fall as long as the cute little ribbon will go. Therefore my back, knees and sanity is saved as well as keeping the pacifier clean instead of allowing it to roll into the corner full of dog fur - you know, the corner that you always seem to miss. I also mentioned in another post how Miss Lola isn't quite a fan of the bath yet. Girl has some pipes on her and makes sure I know she doesn't like to be cold. But I need to start creating a routine with her so unfortunately bath, bottle and bed it is and that's how the routine will stay for the next three plus years of her life. Normally I will get the washcloth nice and warm and lay it on her belly as I wash her. But then most of the time I'd use another washcloth to bathe her which makes double the laundry for me. Okay, I'm already buried in piles of laundry so I needed to work smarter, not harder. 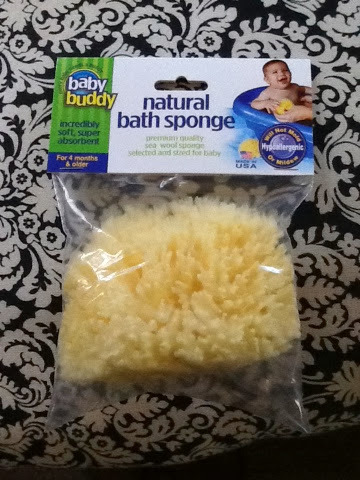 Baby Buddy has this amazing Natural Bath Sponge that is all natural and perfect for my little one's body. Now I can wash Lola with the sponge while using the washcloth as her diva body warmer during her bath. 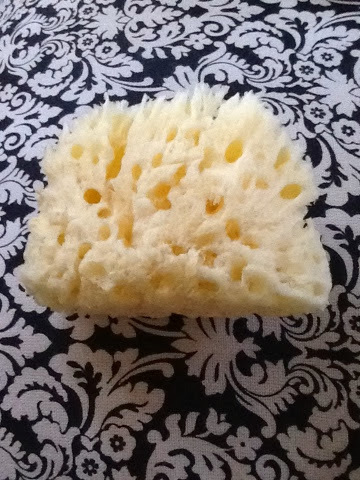 This sponge is amazeballs! It is super soft and soaks up a ton of water. It also lets me get into all of her little crevices - especially under her neck where milk will pile up. Plus it's hypoallergenic and won' mold or mildew -- a double plus! It's the little baby necessities that make the mommy job just that much easier and sometimes you don't realize how handy these things are until you actually have them! These Baby Buddy products have helped solve those little problems and make my life just a little less stressful - and probably helps add less white hairs to my head. Be sure to check out the other products that Baby Buddy has to offer for your little one! Disclosure: I was provided with product samples from Baby Buddy to facilitate my review. All opinions are 100% my own. I hope everyone enjoyed the holiday yesterday with their families and friends! It's now time to gear up for the new year -- cray I know! I also realized the last time I posted Kroger deals was the week before Lola was born. And now we are almost six weeks post birth so I will get on this deal track again I promise! It's a Mega Sale this week at Kroger -- buy 5 of the following items and get $5 off instantly. Prices reflect this $5 savings. --Kashi Go-Lean cereal - $1.99. Use $1.50/2 Kroger digital coupon. Final Price: $1.24 each when you buy 2. What deals did you find at Kroger this week? I know. I'm dying at this cuteness. Don't worry, it just took six or seven times. Yes. I'm that mom that makes them retake it until I like it. Want to join us? Check it out! Crafty Spices is hosting another event and is offering a Bloggers opp, sign up for this opportunity and grow while you help us promote this giveaway. You get a free Twitter link with announcement. And the bloggers who brings in more referrals will get a Free Co-Host Spot. Read on to find out about the prize. This giveaway will begin January 06 and will end January 21. 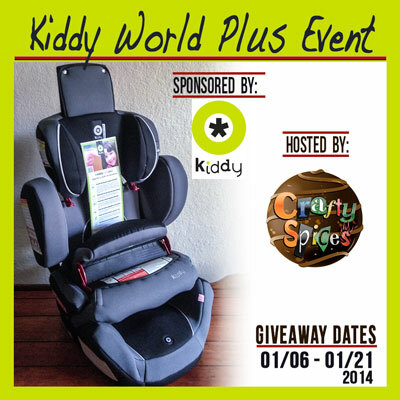 One lucky winners will be selected to receive a Kiddy World Plus Car Seat color of their choice. Additional Links can be purchased at $3 each. These links can be Facebook, Twitter, Instagram, Pinterest or any link as long as you provide (Social network name, user name and your direct link). Miss Lola is 1 Month Old! Somewhere in the chaos and whirlwind of my sleep deprivation, a month has already passed. It's crazy to think that it has already been an entire month since I've had this little gem. She is honestly the sweetest little thing ever. My sweetie pie Cohen was, well, a stinker of a baby in better words. Miss Lola girl is the most chill and relaxed baby. I think she's preparing herself for the world of Cohen as a she gets older. Size: Our pediatrician doesn't do a one month appointment so I'm not sure what she's up to now. However Kurtis got on the scale with her and swears she's 10 lbs now -- I'm not quite sure she's that big but I'm guessing around 9 lbs. 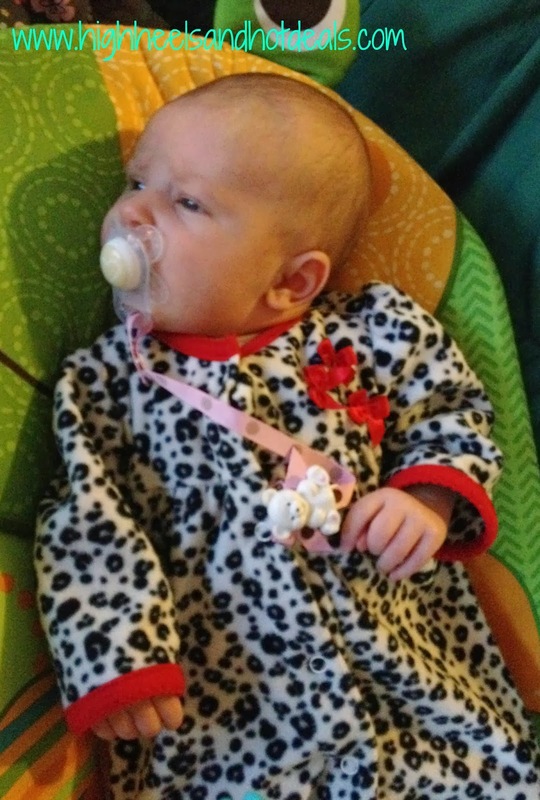 She can still wear some newborn clothes however she is pretty long so the neck pulls down in some of the outfits. I'd say more 0-3 months but not quite 3 months yet. Eating: Mama here is a milk machine and therefore little girl was getting too much, too fast while I'd nurse. Rather than pumping before nursing and then feeding her, I've resorted to just pumping. It's a bummer because it was so much easier to nurse her at night rather than feed and pump at the same time. However, now I can make sure Dad is helping out with some of these nightly feedings so I guess it's a win-win situation. 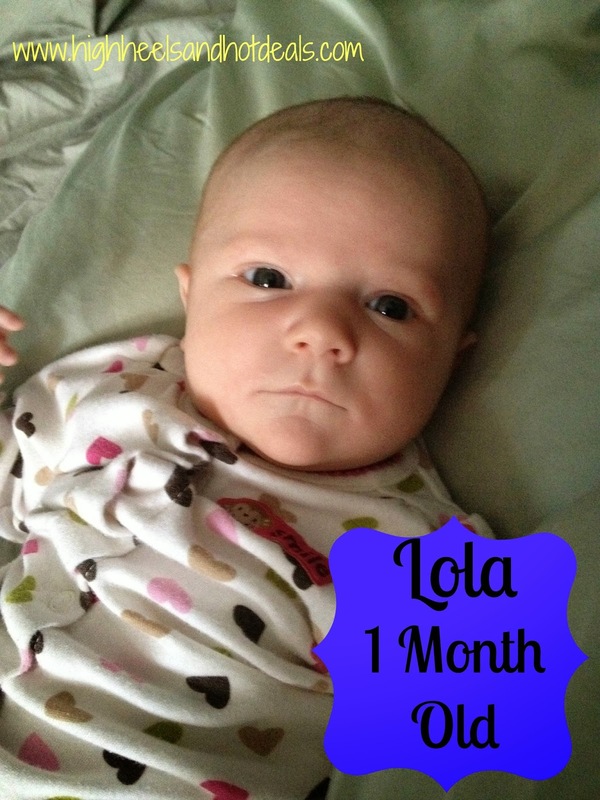 Lola eats about 4 oz every 3-4 hours and will go in 4 hour stretches at night. I am a little concerned that she may have a bit of reflux -- have any of you moms experienced this with your babies? What are the signs? Sleeping: As I mentioned above, she's sleeping in 3-4 hour stretches. I'm all about the Eat-Play-Sleep method and I think it helped her get her nights and days. She is starting to be a lot more alert now during the day. I'm hoping around two months to get more of a routine down as far as nighttime -- the bath, bottle and bed game. Likes: Lola loves to be held and snuggled. She's a fan of car rides, her swing and loves her pacifier. Dislikes: The kid hates being cold. Therefore anytime you change her diaper, clothes or give her a bath she will wail. She also is not a fan of waiting to be fed -- such a diva. Milestones: No major milestones yet. She is starting to track with her eyes and I swear she smiled at me tonight -- but nothing big yet! She is quite a mover and is funny to watch when I put her on her play mat. Lola girl, so far, has been the complete opposite of her brother. The kid loves to sleep and can sleep through mainly anything - including her brother's high pitched/ear splitting squeals. I'm crossing my fingers she continues to be this little sweet pea of a baby. I can't imagine having to go back to work after six weeks. I'm hoping to be able to stay home until after Spring Break. I know. Gee. How nice of my township to allow me six whole week of a maternity leave -- NOT. In the meantime I'll continue to enjoy my baby and loving our new family of four! Today I had made big plans -- Lola and I would be venturing out to her first outdoor mall experience while I finished up some Christmas shopping. However, as I finished getting myself ready I realized my husband had the stroller in his car. But then I remembered, as I slipped the sweatpants and slippers back on, how nice it is to be able to shop online from the comfort of my own couch. I wanted to try out the new Herbal Essences Volumizing Naked Volume Bundle because these hormones are doing a number on my hair. I'm not asking for Jersey hair but just a little flair to make it less drab and more fab. I'm already a fan of Herbal Essences shampoo and conditioner so when I read more about these products, I was super excited to test them out. Plus it contains zero dyes to leave your hair naturally clean and full of irresistible volume. Since this is a limited edition kit that's offered online only, I had to hurry up and head to Walmart.com to make my purchase! The price was too great to pass up - just $12.99! Plus I can have it shipped to the Walmart store of my choice for free or pay a minimal price to have it shipped to my home. Either way the choice was great because I didn't have to leave the comfort of my couch - or remove the comfort of my sweatpants. Check out my video below on you to purchase your Herbal Essences Volumizing Naked Volume Bundle from Walmart.com! Begin by clicking here to head to the product page, then follow my directions on the video! Pretty great, huh? But your day just got greater because now you can win a $50 Walmart gift card to spend on your purchase of the Herbal Essences Volumizing Naked Volume Bundle at Walmart.com! Apparently shopping in my sweatpants makes me feel a bit more giving. P.S. I'll be back to share with you my review of the Herbal Essences Volumizing Naked Volume Bundle once I have the chance to try it out for a few days! Since being at home, I have started to feel very "housewifeish." Unfortunately I do not look like any of the Real Housewives nor do I have their money because if I did, my house would be much cleaner and my nanny would take care of my baby so I could get in a shower every three days. As if caring for a newborn. toddler, husband and crazy dog wasn't enough, I decided that I would make three dozen cookies for Cohen's school program yesterday. So I needed a recipe and an easy one at that. I started where anyone would start - Pinterest. But then things went sour fast because let's get real -- I AM NOT MARTHA STEWART. My sister got those genes...and the sewing genes and the gardening genes and the crafty genes. I did get the shopping gene - CHA CHING! 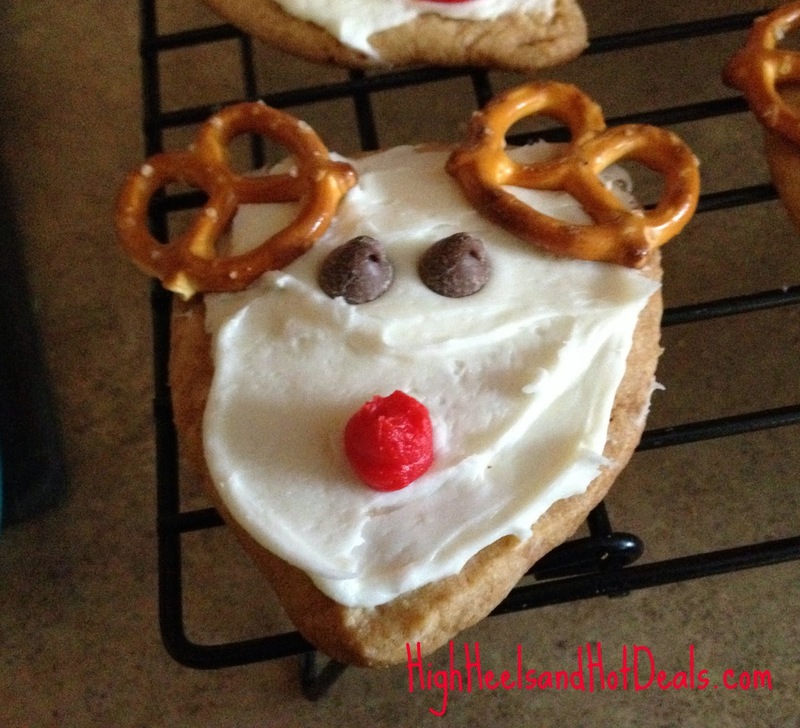 I kept seeing these pictures for these cute little reindeer cookies so I thought I'd give them a try. Where do I need to go now? Target of course! Since I'm not a baker I started where any nonbaker would start - the premade refrigerated cookie dough. Guess what was on the back my friends? 1. Preheat oven to the temperature your dough requires. 2. Break up your roll of cookie dough into a bowl. Add a bit of flour and reshape your dough into a triangular roll. You can also reshape your roll and not break it up if it soft. Just remold it with your hands until it is triangular. 3. 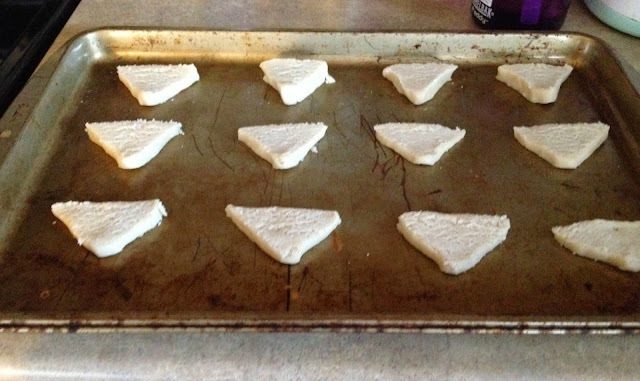 Slice your cookies and place on an non greased cookie sheet. I find the thicker the cookies, the better. Some of my slices were too thing and they stuck to my pan or got really crispy. 4. Bake your cookies based on the time it says to on your dough. I suggest you bake them to the max time and then take them out. They will still be soft so don't make my mistake and over cook them because they'll get hard. Oops. 5. Once the cookies have cooled, frost them with the white frosting. 6. Create antlers with two pretzels at the top. Then add your eyes with the chocolate chips and a red nose with your frosting. You could also use M&Ms for the nose or red hots - which I couldn't find anywhere unfortunately. How cute are these? Thankfully they looked cute so people were fooled before they took a bite and realized they were hard and not soft. They were still good, just not as soft as they should have been. If I can make these you can too. 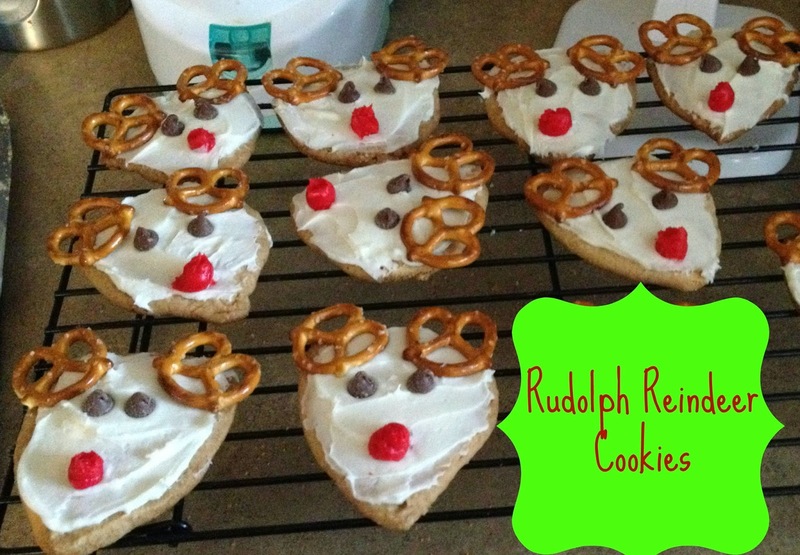 Trust me -- they are super easy but will be a hit at your next holiday party! You forget what it's like to raise a newborn -- until you're doing it again. Oh how the days literally escape you and it ends up being 5 o'clock and you haven't showered for the day. One month in -- routine coming soon. --Oral-B Power toothbrush refill - $5.99 and get $2 ECB. Use $2 off (RP 11/24). Final Price: $1.99 after ECB. --BIC disposable razors - $6.99 and get $2 ECB. Use $2 off (SS 12/15). Final Price: $2.99 after ECB. --Axe gift set - $9.99 and get $2 ECB. Use $2 off (RP 12/15). Final Price: $5.99 after ECB. --Chex Mix or Gardettos - 3/$6 and get $2 ECB when you buy 3. 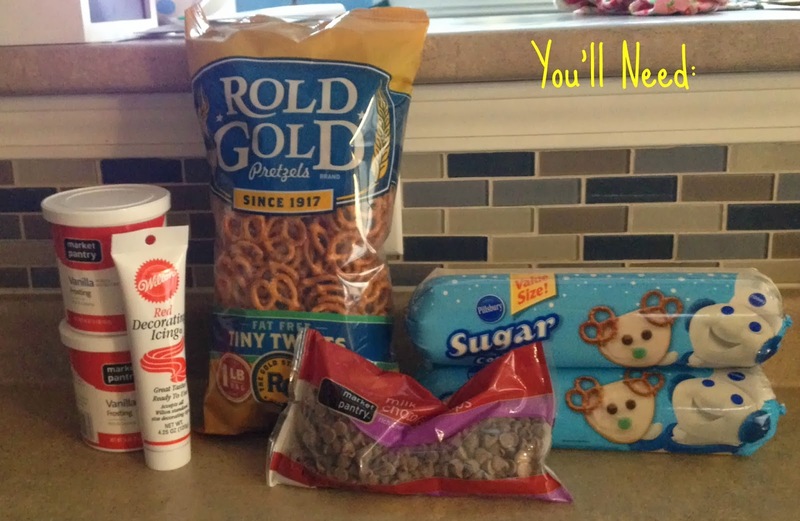 Use $1/2 (SS 10/27) or $0.50/Chex Mix printable. Final Price: $0.83 each when you buy 3 after ECB. --Special K cereal - 2/$5 and get $1 ECB when you buy 2. Use $1/2 (RP 12/15). Final Price: $1.50 each when you buy 2 after ECB. --Dawn - $0.88. Use $0.50/Hand Renewal printable. Final Price: $0.33 -- HOT deal! What was your favorite deal at CVS this week? If your kids are anything like mine, they are obsessed with the iPad and can navigate that things better than I ever will be able to in my life! However, a three year old doesn't have the most careful hands. Therefore a sturdy and kid friendly iPad case is a must in our house -- and here's your chance to win a Gripcase for your iPad! 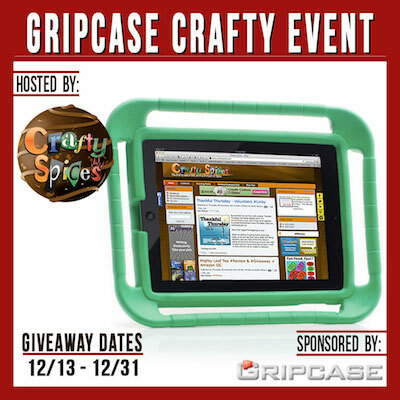 We present to you another great giveaway brought to us by Crafty Spices, a Kids friendly iPad cover Gripcase, which offers many colors to choose from. This giveaway will begin December 13 and will end December 31, it is open to all U.S. and Canada residents age 18 and over, void where prohibited. One lucky winners will be randomly selected from all valid entries and verified, her or she will receive a Gripcase (Winnes color choice). Winner will be notified via email, he or she will have 48 hours to respond, if not another winner will be selected. Disclosure: Jay @Crafty Spices did receive a product for free and will be sharing her opinion with all of us. Her opinion may differ from ours and yours. Neither Crafty Spices or High Heels and Hot Deals are responsible for sponsor prize shipment. Winner will be contacted by email and will have 48 hours to respond before another winner is selected. All entries will be verified. 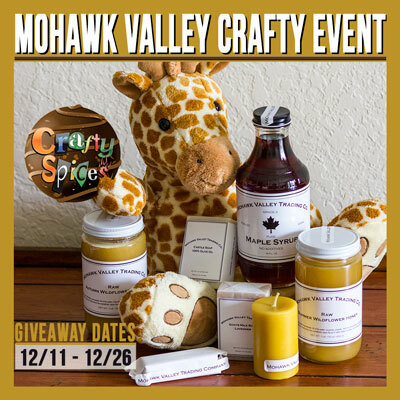 I love a good natural product - that's why I'm teaming up with Crafty Spices to share this amazing giveaway from Mohawk Valley with you all! Great giveaway going on over at Crafty Spices, it's all about Mohawk Valley Trading Company, whom have a variety of Natural products that are great, Jay has done a full review on these products go and check it out here. And of course don't forget to join the giveaway via the rafflecopter below. This giveaway will begin December 11 and will end December 26, it is open to all U.S. and Canada residents age 18 and over, void where prohibited. One lucky winners will be selected to receive a Gran Prize Pack ARV: $80.00 (One 16 oz. Glass Bottle of the Grade A, Robust, Dark, Pure Maple Syrup; One 1lb Glass Jar of Raw Summer Wildflower Honey; One 1lb Glass Jar of the Raw Autumn Wildflower Honey; One, 1.5” x 2.5” Beeswax Candles; One bars of Natural Handmade Castile Soap, & 1 Goat’s Milk Lavender Soap). Disclosure: Jay @Crafty Spices did receive products for free and is sharing her opinion with all of us. Her opinion may differ from ours and yours. Neither Crafty Spices or High Heels and Hot Deals are responsible for sponsor prize shipment. Winner will be contacted by email and will have 48 hours to respond before another winner is selected. All entries will be verified. Okay, I'm starting to get my feet back underneath me...sorta. I find that the time of the day just slips me now -- one minute it's 8:30 and then I look at the clock again and it's 3:00 and time to get Cohen from school. Soon my life will slow down - but I'll try to get these deals posted before Miss Lola wakes up from her nappy. --Hershey's Holiday Kisses or Candy - 2/$6 and get $3 ECB when you buy 2. Use $1.10/2 printable or $1/2 (SS 12/8). Final Price: as low as $0.95 each when you buy 2 after ECB. --General Mills cereals or Nature Valley bars - 3/$9 and get $3 ECB when you buy 3. Use $1/2 Chex printable or $1/2 Select Cheerios (SS 12/8) or $1/2 Select General Mills cereals (SS 11/24) or $1/2 Nature Valley bars (SS 10/27) or $1/3 GM cereals (SS 10/27). Final Price: varies but great cereal stock up price! --Colgate Optic White Rinse - $5.99 and get $3 ECB. Use $2 off printable. Final Price: $0.99 after ECB. --Colgate 360 toothbrush - $2.99 and get $2 ECB. Use $0.50 off (SS 11/24). Final Price: $0.49 after ECB. --Right Guard and Dry Idea deodorant - 2/$6 and get $2 ECB when you buy 2. Use $1/2 Right Guard (Right Guard's Facebook page). Final Price: $1.50 each when you buy 2 after ECB. -Nivea body wash or scrub - $4.88. --Softsoap liquid soap or Beauty body wash - $1.88. Use $1 off CVS coupon (coupon machine in store). Final Price: $0.88. --Almay makeup remover - $5.99 and get $3 ECB. Use $1 off (SS 11/17). Final Price: $1.99 after ECB. --Advil Film Coated - $4.99 and get $2 ECB. Use $1 off (RP 10/27). Final Price: $1.99 after ECB. --Pampers jumbo packs - $8.99 Buy 2 and get FREE wipes. Use $1.50/Cruisers printable or $1.50/Swaddlers printable or $1.50/Baby Dry printable. Final Price: $7.49 each plus free wipes. What great deals did you find this week at CVS? 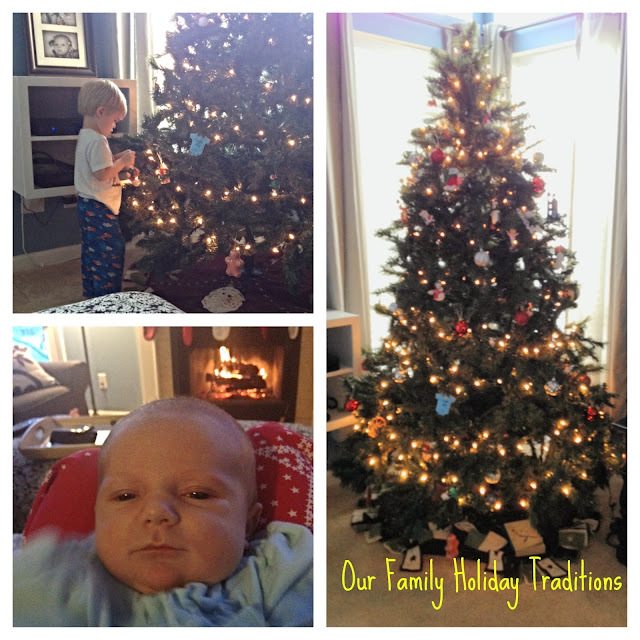 This is the first holiday season my family has been able to enjoy alone and at our own home. I'll be honest with you - it has been completely stress free without having to worry about packing, traveling and even the threat of winter weather adding or taking away days from our planned visit. We have been able to sit and enjoy the holidays from our home which has been a great opportunity to share new traditions with Cohen as he grows older and starts to understand the true meaning of the season. However, one of the downsides has been the lack of family around us which is a bummer. Luckily we have been blessed with the amazing word of new tech where we have the options of things like FaceTime, Skype, texting and unlimited minutes to talk with family and friends that we aren't able to see during the holidays. Our stepdaughter is one of the family members that we have to split time with during the season. Being a preteen, she is all about the latest and cool gadgets. But her current phone plan is pretty basic (and expensive), and honestly, does a preteen really need all of the fancy schmancy bells and whistles of a phone plan? Even more importantly, is it necessary that we should pay an arm and a leg on a student mobile plan to give her those bells and whistles if it truly isn't needed? I decided to do some research and see what deals and offers I could find that were appropriate for her age. 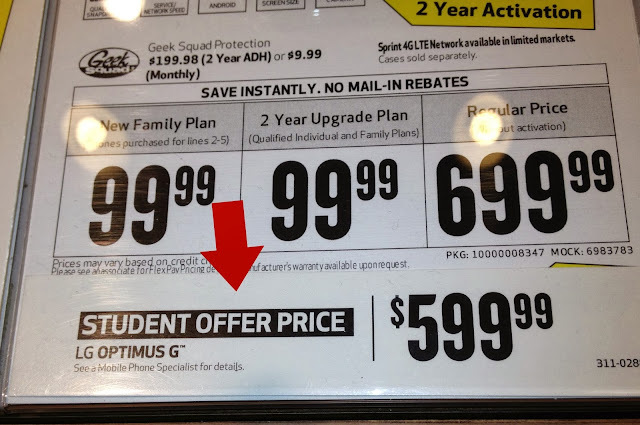 That's when I came across the Sprint My Way Student Promotion that is only offered through Best Buy Mobile Specialty Stores. These stores are located conveniently in your local malls - so you can stop on in while you do some holiday shopping! I decided to load Lola up for her first big "outing" to head to my local Best Buy Mobile Specialty Store to get more information about this promotion. As I entered my Best Buy Mobile Specialty Store I was greeted with a super sweet salesperson, Ciara. I explained to her my dilemma -- my husband and I were considering purchasing our stepdaughter a new cell phone to maintain better long distance communication with her, but we wanted an affordable plan and one that we'd be able to monitor as well. I asked Ciara about the Sprint My Way Student Promotion and how it worked. I needed more deets about the program before I agreed to anything. Ciara was super upbeat and definitely willing to share the important perks of the promotion. It's a free wireless plan for students through Sprint and is available only though Best Buy Mobile Speciality Stores. Yes, I said FREE wireless plan. Students who qualify can get twelve months of free unlimited calling and texting along with 1GB of data with the purchase of a smartphone. If students need more than 1 GB, you can upgrade to unlimited data and pay just $10 a month for your wireless plan. That, my friends, is a monthly savings of over $70! Now take that times twelve and figure out how much you will save in a year on your student's phone plan. Maybe you are like us and don't feel comfortable purchasing a smartphone for your kiddo yet. 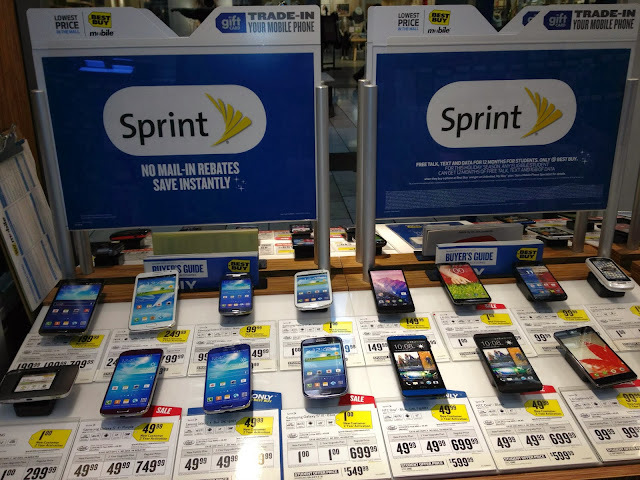 You can purchase a basic phone with unlimited talk and text and blocked data on the Sprint My Way Student Promotion and save over $50 each month. Plus all lines will have unlimited talk, text and data through the Sprint network for as long as you stay with Sprint - no random and unexpected plan changes after a few years. 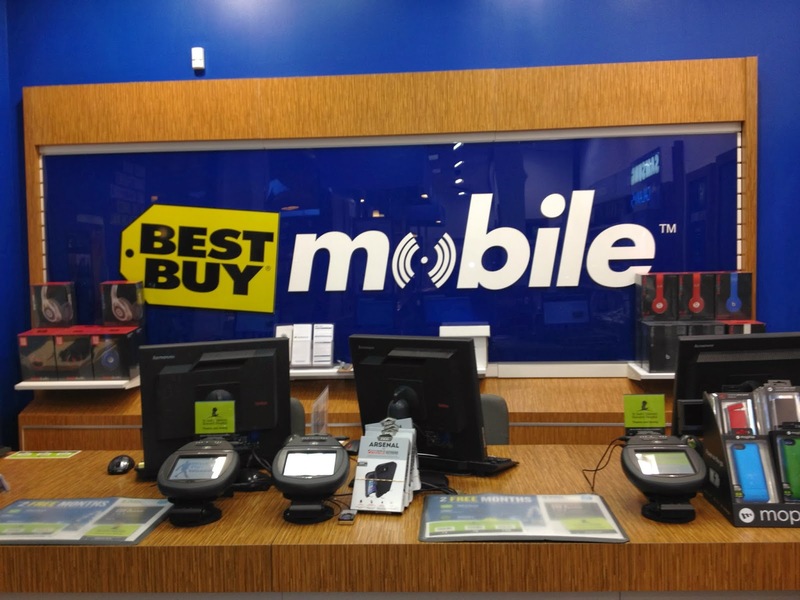 Students just purchase their phone and pay a one time activation fee to get their plan started. The great thing about the My Way Student Promotion plan is students get to pick their phones and pay the Student Offer Price for the phone, which is less than full retail value and it becomes theirs to keep. Then, you pay a onetime $36 activation fee to get things started and voila! You are all set! Ciara did share with me that students have the option to trade in their old phones for up to $200 of Best Buy Mobile Specialty Store credit which in return can be used towards the purchase of their phone for their Spring My Way Student Promotion to lower the cost of the phone at time of purchase. The My Way Student Promotion is available to any student. Ciara shared that some parents with children even as young as seven have taken advantage of this free student wireless promotion. Students need to show proof that they are a student using an ID card, report card or proof of tuition to validate their student status. Therefore it is available to students elementary aged through college! 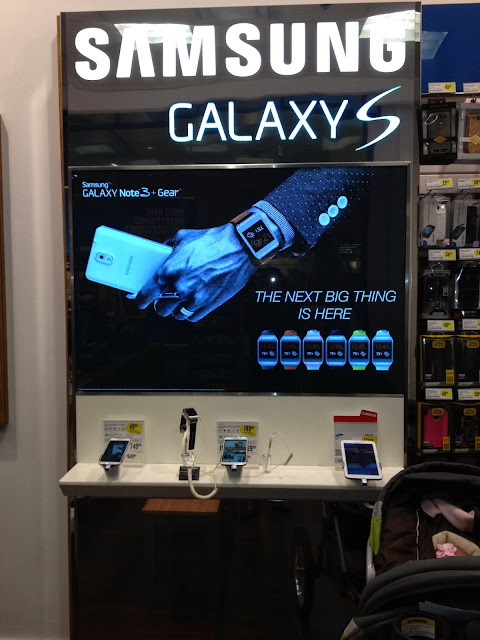 After learning about the My Way Student Promotion, I had a chance to browse the eligible phones. I noticed right away the visible Student Offer Price and was highly impressed with the series of phones that were offered for this deal. You have every option from a sophisticated smartphone to your basic cellphone to choose from when you sign up for the My Way Student Promotion. 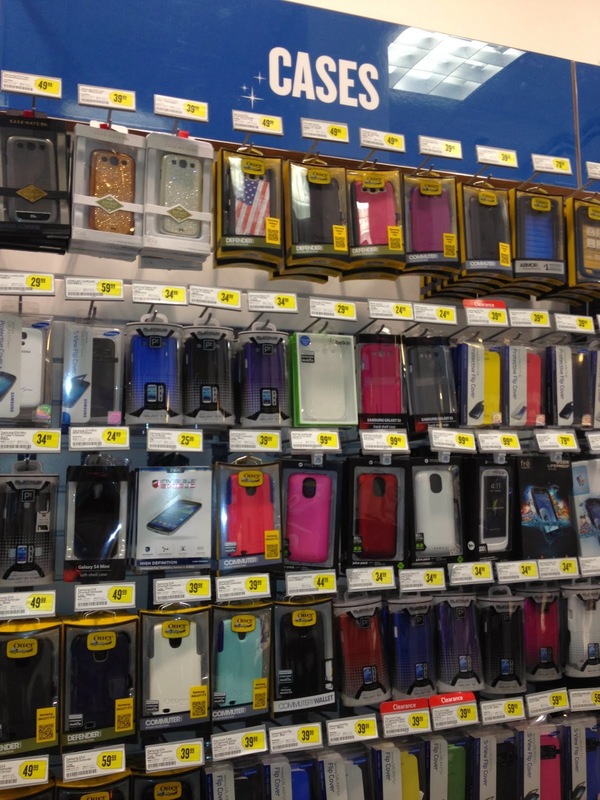 The loads of accessories and cases to dress up your phones was beyond belief too! 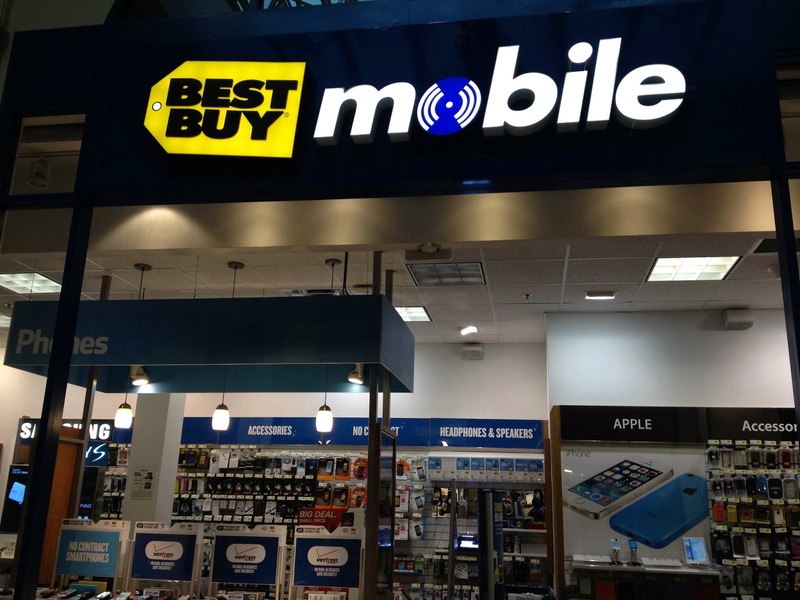 Best Buy Mobile Specialty Stores definitely have you and your phone covered this holiday season. Lola and I took our information from our new friend Ciara and headed home to discuss our options with dad. Since we do have to split our time during this holidays with Sophie, now may be a perfect time to upgrade her plan to the My Way Student Promotion so at least we can call and text her whenever we want and not worry about going over our minutes or text allotments. Plus this would make a perfect Christmas present and give us with the opportunity to discuss responsible choices. I can't wait to share this amazing promotion with my mommy friends. The My Way Student Promotion is the perfect way for college students to keep in touch with heir families during the holidays - especially with finals looming around the corner. I remember feeling stressed and homesick during the holidays and even though I was able to eventually head home for break, it would have been nice to have the option of keeping in touch with my families through a mobile plan that was so affordable and accommodating for my personal needs as a student. Hurry to your Best Buy Mobile Specialty Store to sign your students up for the My Way Student Promotion and pay nothing for twelve months of amazing Sprint service. This promotion ends January 4th, so now is your chance to hook your student up this holiday season! 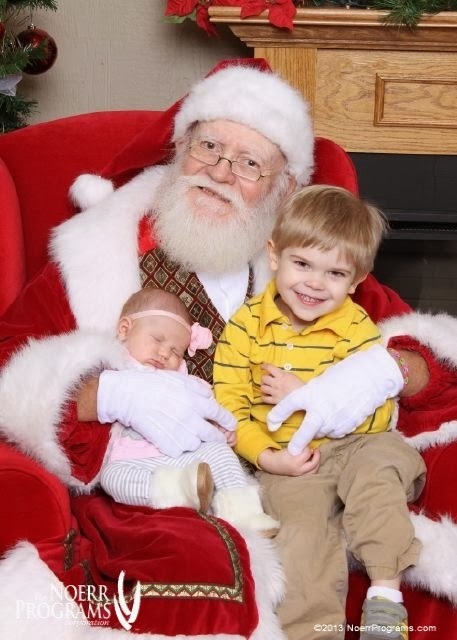 It's taking some time adjusting to life with two little ones. Now that my husband's back at work, it's time for me to start thinking about my workforce plans even if they aren't for a few months. Heading back to work with Cohen was hard. I exclusively pumped for six months but with being a teacher, it's unfortunately hard to find time and privacy to pump and store my milk. We then switched between formula and breast milk to help him adjust before we went cold turkey with just formula. But with the cost of diapers, wipes, childcare and now formula -- this kid was getting expensive! Like any mom, however, I wanted what was best for my little guy and that usually meant paying an arm and a leg for name brand formula. They say with your second child you tend to loosen up because you've already gone through the process once before. I'm currently pumping again for Lola but there are some nights where I just don't have the energy to get out the mess of the pump and such nor can I keep my eyes open. But the thought of expensive formula makes me cringe. I want to be able to stay home for a bit but if I switch Lola to formula, I'll be back to work in a matter of weeks because the cost of the name brand formulas alone will be a huge cramp in the budget. 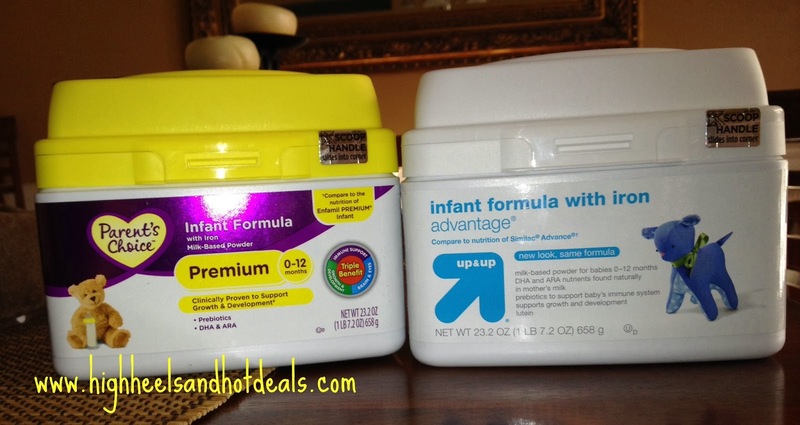 When I was asked if I'd review store brand formula from Perrigo Nutritionals I was super hesitant. 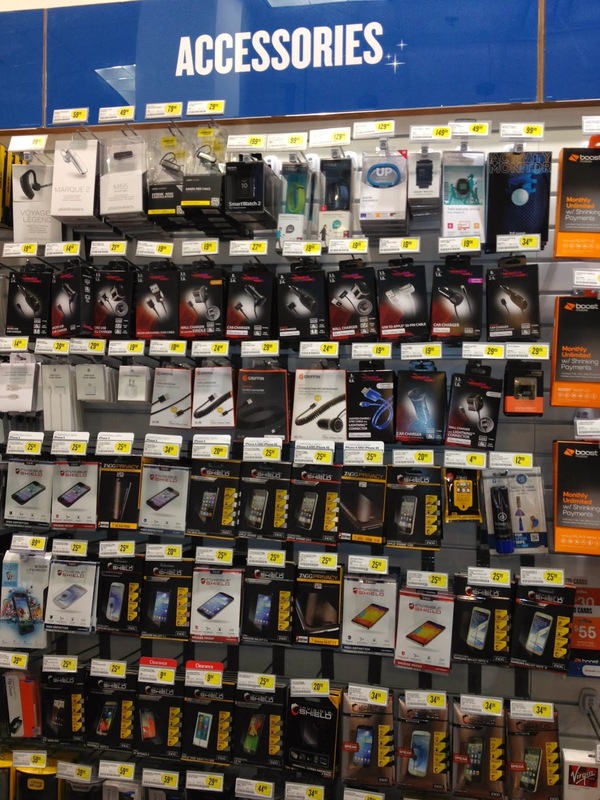 How can a store brand offer the same at the national brand formula? Surely it cant, right? 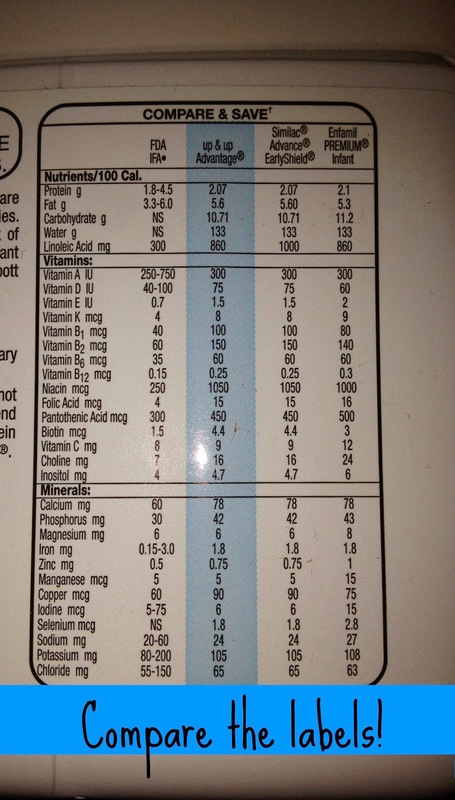 I actually compared the ingredients of both containers - Perrigo Nutritionals store brand and the national brand. Both cans had basically the exact same ingredients no doubt about it! One may have had a little bit more of a certain ingredient than the other but overall the comparison was basically identical. Perrigo Nutritionals formulas are comparable to Similac, Gerber and Enfamil but are just about half the cost as those name brands. They also offer different types of formula, including soy based and milk based, so you are sure to find the right kind for your baby. Still, I was a little leery. What new mom isn't? Then I started reading the facts on Perrigo Nutritionals formulas and was absolutely blown about by what I learned! --Perrigo Nutritionals is the largest supplier of Store Brand Infant Formula and nutrition products in the world and one of only four companies recognized by the U.S. Food and Drug Administration for meeting the strict FDA requirements for safety, nutrition and quality for infant formula-manufacturing in the United States. 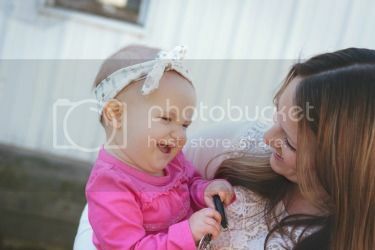 --According to a recent survey conducted online by Harris Interactive, 75 percent of American moms plan to return to work after they have their baby. --Of those moms returning to work, 42 percent attribute their stress to feeding their baby. Perrigo Nutritionals formulas offer the same nutrition and quality as the national brands and follow the same safety regulations that are mandated by federal legislation like any other formula company. Plus you can find them at any of your local retailers like Target or Wal-Mart. Check out Perrigo Nutritionals' website fore more information! We all want what is best for our babies and we are already a worrying mess when we head back to work. So the last thing we want to have to worry about is making sure they are getting not only the nutrition that they need but also good, quality care.. I remember when I went back to work after Cohen, I felt guilty that I couldn't stay home with him. As much as I would love to be a stay at home mom, that is not in our plans right now. 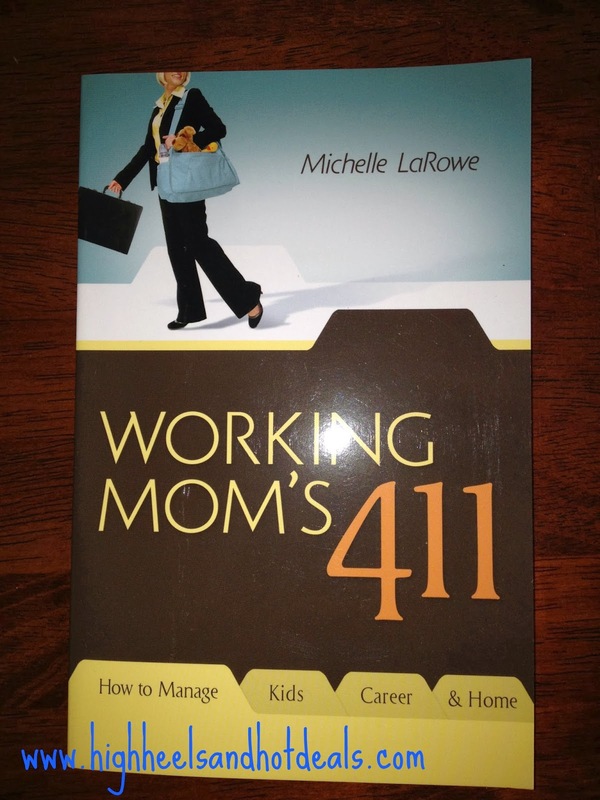 But these five tips from Michelle LaRowe, author of "Working Moms 411" have made the thought of returning back to work much easier -- and they make perfect sense. 1. If you don’t have quality childcare, you won’t be able to focus on anything else. Whether you choose a nanny, enroll your child in daycare or have a family member provide care, if you’re not confident your child is safe and being well cared for, you won’t be able to get any work done. 2. A momtourage is a necessity. Now is the time to find out the people, places and things that can make your life easier. Whether it outsourcing the pet walking or ordering your groceries online, figure out who and what you can count on to give you more time in your day to spend with your family. 3. If you don’t take care of yourself, you can’t take care of anyone else. Set your alarm to get up 15 minutes before everyone else to have your cup of coffee in peace. If you can't hit the gym, take a brisk walk during your lunch break. If you aren’t meeting your own needs, you won’t be able to meet the needs of others. 4. You’ll need to adjust your expectations. Sure, you can do it all and have it all if you’re willing to refine what that means. You’re too tired to prepare a home cooked meal every night. Consider starting an office meal swap. Make double of a meal one night per week, have a coworker do the same things and switch and get two meals for the trouble of one. Don’t let anyone fool you. Whether you are a working mom, stay at home mom or work from home mom, guilt is mommyversal. Just because you feel guilty doesn’t mean you are guilty. If you’ve made the right choice for your family do yourself and your baby a favor: let go of the guilt. Make the formula transition easy on yourself and your pocket. Perrigo Nutritionals offers store brand formula that is comparable to the national brands but at half the cost. Your baby is getting the same nutrients but you aren't breaking the bank because of the cost. Put your mind at ease and give yourself one less thing to worry about as you return back to work. Perrigo Nutritionals has you and your family covered. --One (1) lucky winner will win a prize pack including two cans of Store Brand Formula from Perrigo Nutrtionals, a copy of parenting expert Michelle LaRowe’s new book, “Working Moms 411,” and a daily planner to help keep you organized. Open to US residents only. Check out the Rafflecopter below to enter. Grow Your Followers and Join the Gripcase Giveaway Event! Crafty Spices is hosting another event and is offering a Bloggers opp, sign up for this opportunity and grow while you help us promote this giveaway. And by the way Gripcase has this promo going on were for every Gripcase that you buy they will donate one to the school of your choice. . This giveaway will begin December 13th and will end December 31st. One lucky winners will be selected to receive a Gripcase color of their choice.